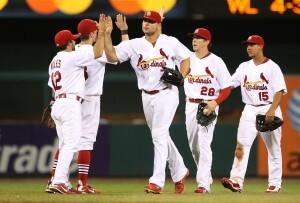 The Cardinals won their 8th in a row, a 5-1 win over the slumping Phillies on Wednesday night at Busch Stadium. I know they say the players decide the game with their play on the field, but I thought Phillies’ manager Charlie Manual cost his team a good chance of winning. The turning point of the game came in the seventh inning. Neither bullpen had anyone warming up and the Phillies loaded the bases with two outs in the seventh inning against Jaime Garcia who was reaching his end point. Instead of getting someone up and ready, Manual elected to trot out Joe Blanton his starting to pitcher to hit in a tie ball game with bases loaded. He hacked at three pitches and Garcia made him look foolish striking out the pitcher the end the threat. Then Matt Holliday led off the bottom of the seventh with a solo homer and just like that the Cardinals were up 2-1. I just expected against a hot team, bases loaded in a tie game, you’d have someone ready in your bullpen and bring up a position player with a chance to grab the lead in the late innings. Hey, I’m not complaining…I’ll take it. Blanton marched out there to start the eighth inning as well, but the Cardinals chased him scoring three more runs to put the game out of reach. Garcia is now 9-4 on the year. He gave up four hits, one of those a solo homer by Ryan Howard, his 22nd. Holliday’s homer was his 18th of the year.